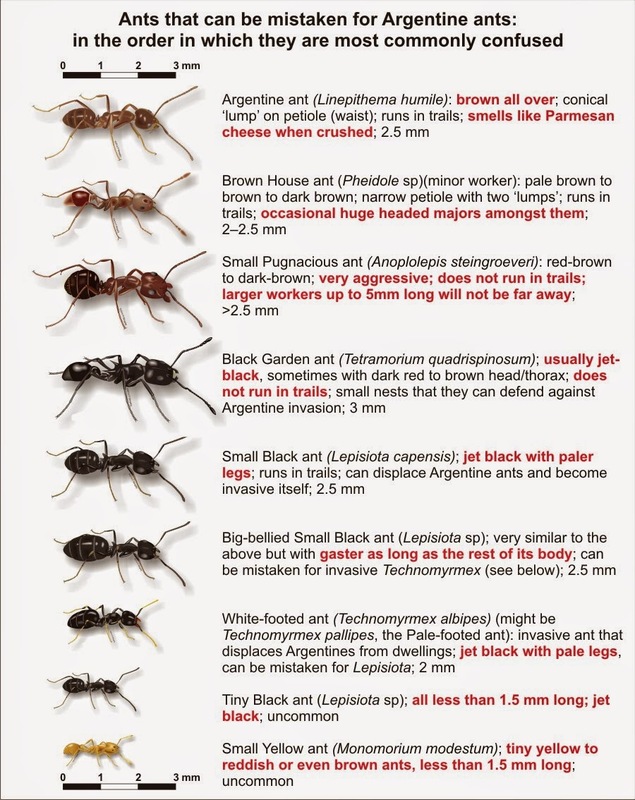 Argentine ants are probably the most widespread and economically-important ant-invaders on Planet Earth. The Genus Linepithema does indeed hail from Argentina, where several species live inconspicuous lives in the countryside near Buenos Aires. Most of these species can be easily mistaken for each other, but only one has learned to spread by nest-budding, and so become a world-wide threat. 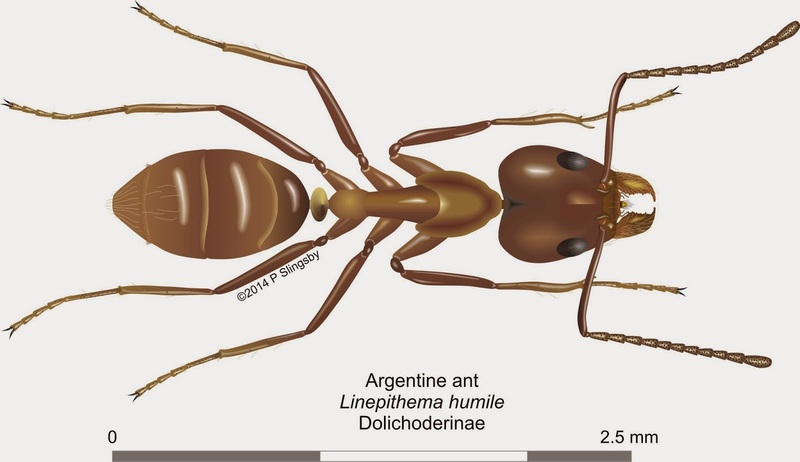 Linepithema humile is our prime suspect, and can be told apart from other ants in Linepithema by the jagged edge to their mandibles, and the fact that they only have hairs on the last two segments of the gaster. You need a pretty good microscope to pick up these characteristics, so it’s just as well that there’s only one Linepithema that we need to worry about. Argentine ants are popularly supposed to have arrived in RSA in fodder imported from Argentina for British horses during the South African War, but there is evidence to suggest that they have in fact been around since as early as 1750. They occur in every town and most human settlements in the Western Cape, extensively in some farmlands, and also in some natural fynbos and strandveld. They attack roosting poultry, spoil food everywhere, and succour plant pests in orchards, etc. They are potentially devastating to the survival of many fynbos species, including some of our most iconic beauties, because they totally disrupt the effective distribution of seeds by indigenous ants. They are widespread around the world except in very humid areas, and there is evidence that the Northern Hemisphere plays host to three enormous super-colonies of this ant, with uncountable trillions of individual ants. Several features make them easy to identify, but they are also easily confused with some indigenous species (see chart below). Their colonies are large; they spread by budding, where mated queens run out in the trails with the workers to any good food source, establishing a branch of the parent colony there. Vast, interlinked colonies that are highly resistant to eradication are thus established. They have no stings but squirt a disabling substance onto their enemies, and in this way are able to overcome most indigenous ants, including even the most aggressive of these. The spectacle of tiny 2.5 mm Argentines overcoming and defeating our magnificent 20 mm Camponotine ants is heart-rending. Well, if you’re an ant lover, of course. To help you identify them see the chart below, where several similar-sized indigenous species are pictured to scale, running in the same attitude as the Argentines. Thanks a lot for the info a dedication to the subject. I was reactant to do anything about the huge number of ants we have until i managed to identify them as these. Now i calls for War, they are all over Kensington JHB, do you have any suggestions as to the best approach? I have not seem many other ant species, just one that seemed part of the colony which was bigger, predominantly the head. So i dont think i need to worry about the local population. The large headed individual suggests that your ants are an indigenous species, Pheidole megacephals [Big-headed house ants] which can become quite a nuisance. 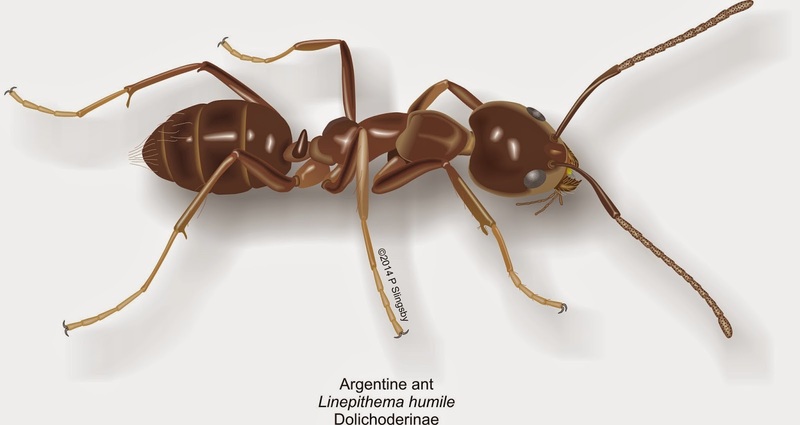 The minor workers are easily mistaken for Argentine ants but with magnification you'll see that they have a 'double-noded' waist or petiole, whereas Argentine ants have a single node. If you flood the nest and the ants swarm out with their brood they are probably Argentines; if not, they are definitely not Argentines.